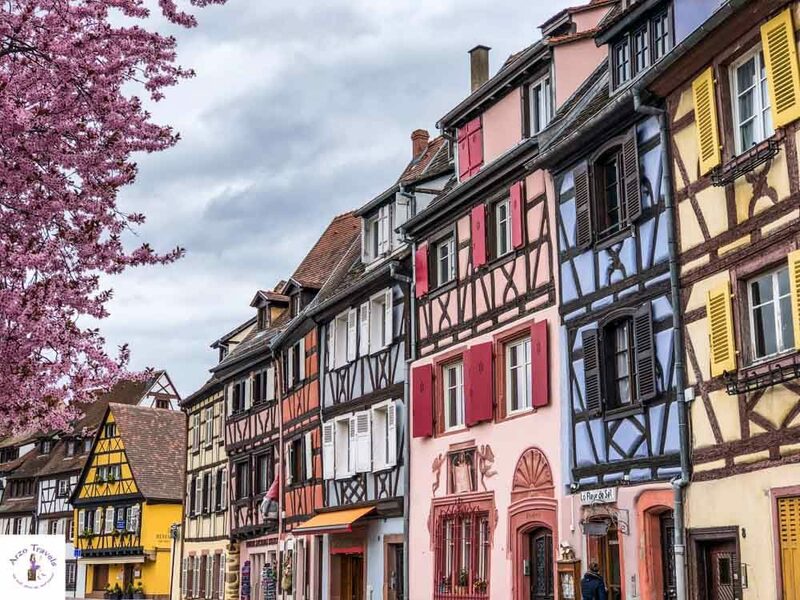 Nestled among vineyards with its traditional houses, canals, and floral displays, Colmar is a picture-perfect fairytale dream. And because of this, Colmar has become an incredibly popular destination in France. After visiting Annecy, another fairytale town in France, about 1.5 years ago, I was quick to name it the most beautiful town in the country. With its colorful and pretty houses, water canals, and Lake Annecy, it was easy for me to declare it as the prettiest town around. Looking at pictures of it, it seemed to be almost as pretty as Annecy, but pictures can deceive. So, I knew I had to visit for myself before I could make the final judgment. 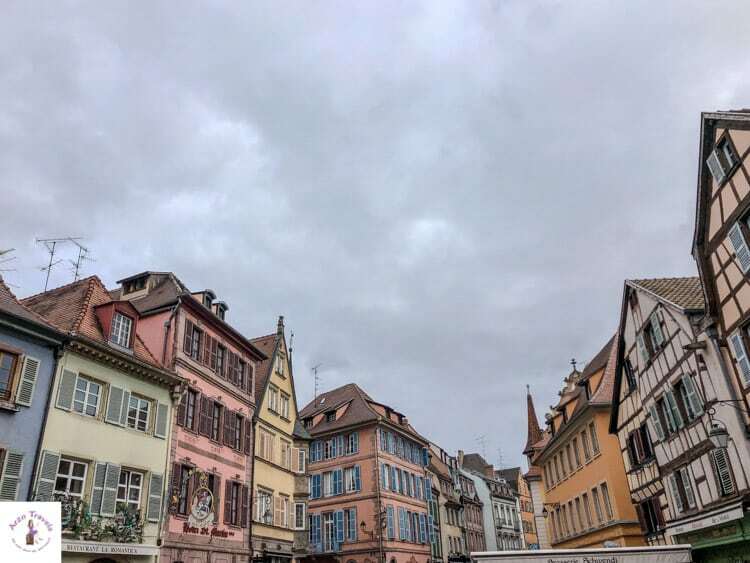 And so I added Colmar to my Alcase road trip, and after a few days in Strasbourg and its surroundings, I finally visited Colmar. 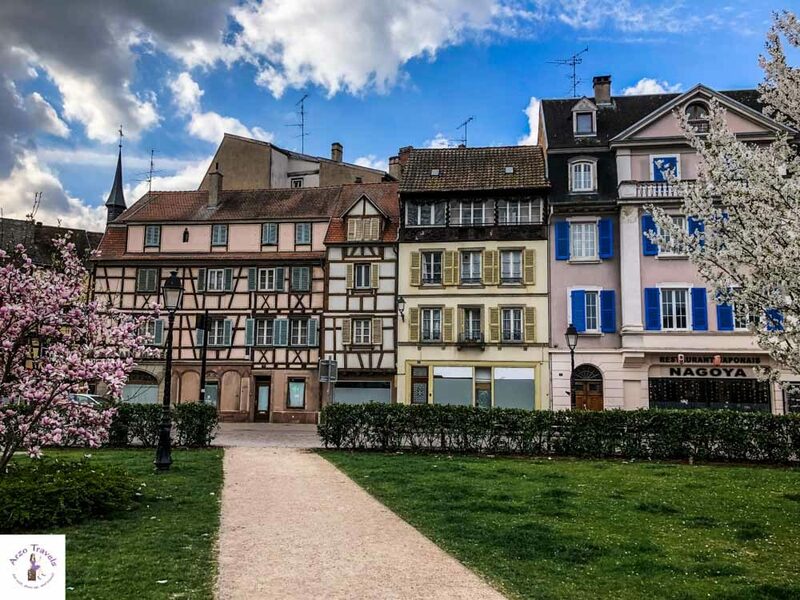 Before I let you know my final conclusion – who really deserves the title of the most beautiful town in France – I will share my travel tips for Colmar. 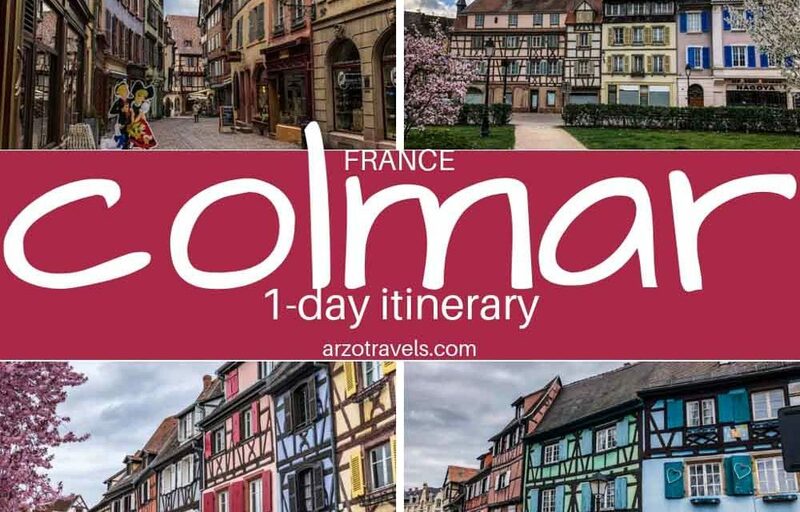 Find out about the best things to do in Colmar, the best places to visit, and the best attractions to see in one day in Colmar. Alsace, France’s smallest region, is perched on the edge of Germany and Switzerland, on the Rhine River. It is now part of France (but had been part of Germany several times) and combines the best of these two countries. 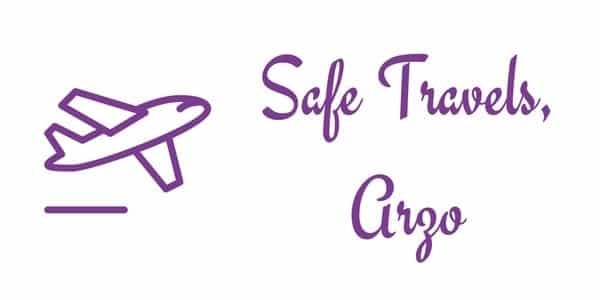 Flying: Colmar does not have an airport and the closest airports are Strasbourg-Entzheim (70km from Colmar), Basel-Mulhouse-Freiburg (about 70 km away) – from both airports, you can easily get to Colmar by train. Train: Colmar is linked to the largest French and European cities either directly or by changing trains. The train station is close to the old town of Colmar, and after a short walk, you can reach it on foot. Car: I arrived in Colmar by car, coming from Strasbourg. It was part of a beautiful Alsace road trip I took, and it was very scenic. 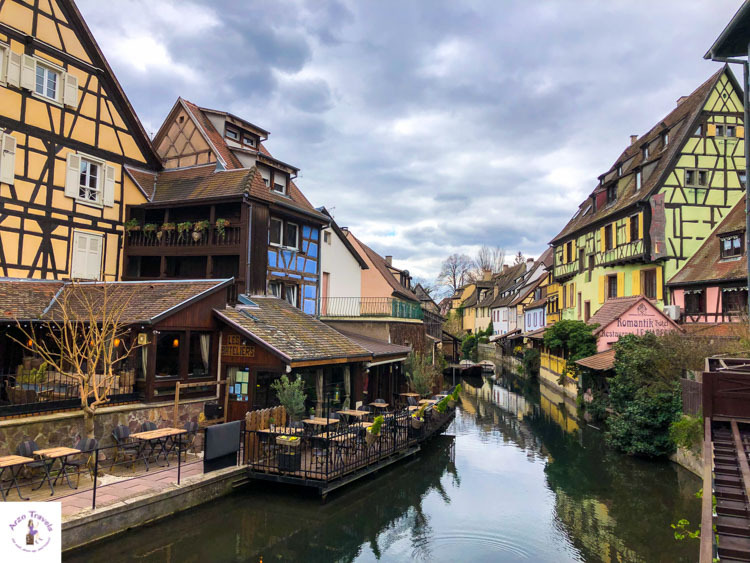 In Colmar, you will most likely just visit the old town – and the good news is that Colmar is so small and walkable that walking is the best way to get around. On the flip side, Colmar is so small that you are “done“ quickly. However, if you don’t want to or can‘t walk that much, you can either do a sightseeing tour on the small mini trains you see everywhere or you could rent a bike. There are also boat tours available (more on that later). I stayed at the 3-star Colmar Hotel and I loved it. I booked it more or less last-minute via booking.com (my preferred booking site, as I can often cancel hotels up to 24 hours in advance, which helps since I am a very spontaneous person) and mostly because of its free parking and proximity to the old town (it is not directly located in the old town, but about a 10-15 minute walk). It is just next to the train station, so whether you get here in your own car or by train, the hotel is perfect. Also, the breakfast was great (including muffins, crepes, pancakes, and much more) and the rooms were clean, bright, and modern. It is for sure my first pick for Colmar. 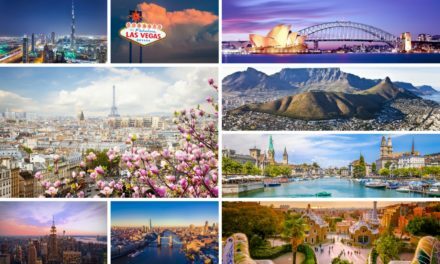 To find out more about the hotel and check out rates, click here. 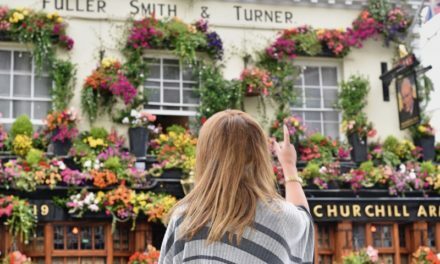 While I am always a fan of getting lost and just seeing where I will end up, I also try to find out about certain places/houses/attractions so that I do not miss out on the highlights (believe me, that has happened to me, and now, I try to have at least a basic “get lost” itinerary). You can get a free Colmar map either at the hotel or the tourism office and walk the route that is outlined. 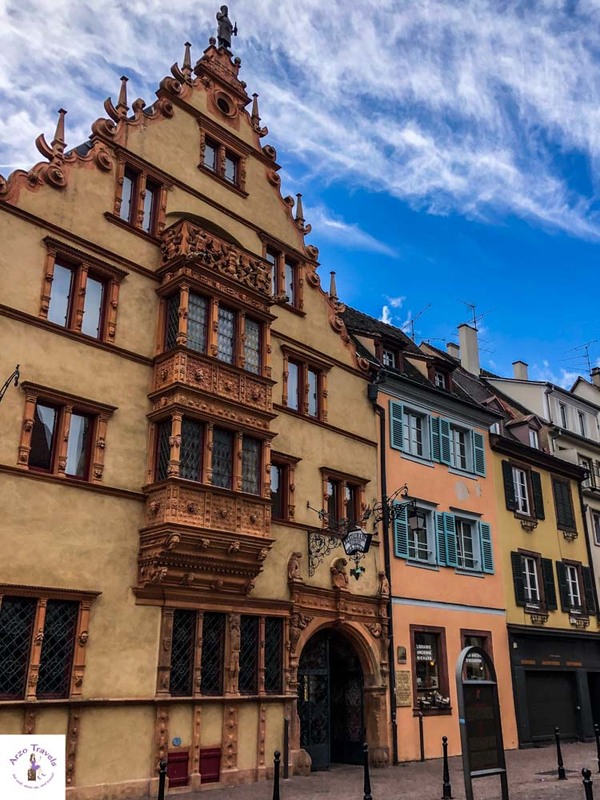 There are also signs for main tourist attractions, so you will find them by just following the signs, or you can follow the golden triangles (embossed with Lady Liberty) and see the best Colmar attractions. So, the old town is one of the best places to see in Colmar – or better yet, THE best place to visit. Very picturesque, Little Venice is a main tourist spot. This colorful neighborhood starts behind the Koifhus and goes through the fishmonger´s district and to the bridges Turenne and Saint-Pierre. It is also the most photographed area (I assume after looking at Instagram). It is very small and there are not even that many streets you could discover! So, even if you want to explore each street and look at each house, you will not need endless hours for it. When I visited, it was so lovely with all the blossoms, but I missed all the flower pots that I saw in other pictures. I am sure this would have added to the beauty of Colmar. 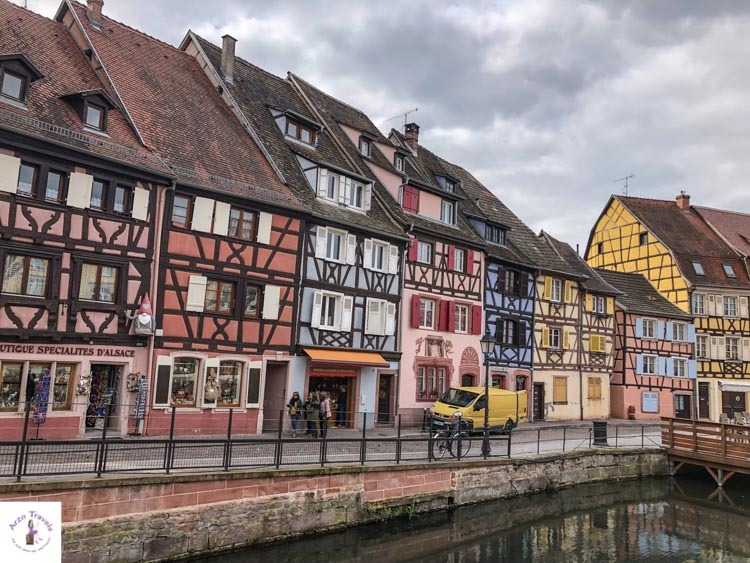 Apparently, Colmar inspired the setting of Disney’s Beauty and the Beast – no wonder, with these colourful houses, narrow streets, and the canal. What you will find a lot of in the old town of Colmar are little shops, restaurants, and bakeries. 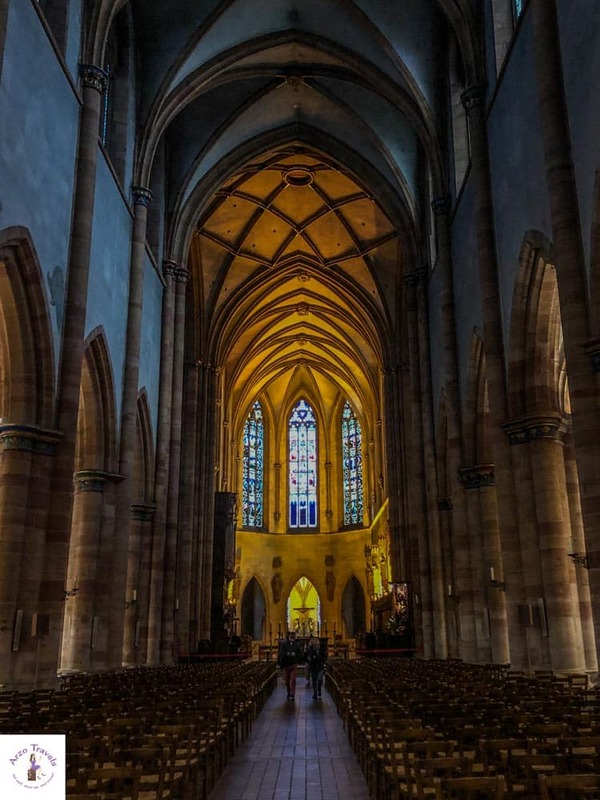 There are several interesting and impressive churches in the old town of Colmar – Saint-Martin Collegiate Church at Place de la Cathedrale is probably the most amazing. The church was completed in the late 14th century, and not only does it look impressive from the outside, but from the inside, too. Built in 1537, the decorated Renaissance-style Pfister house features paintings from the Bible, as well as German emperors, and is based heavily on medieval architecture. 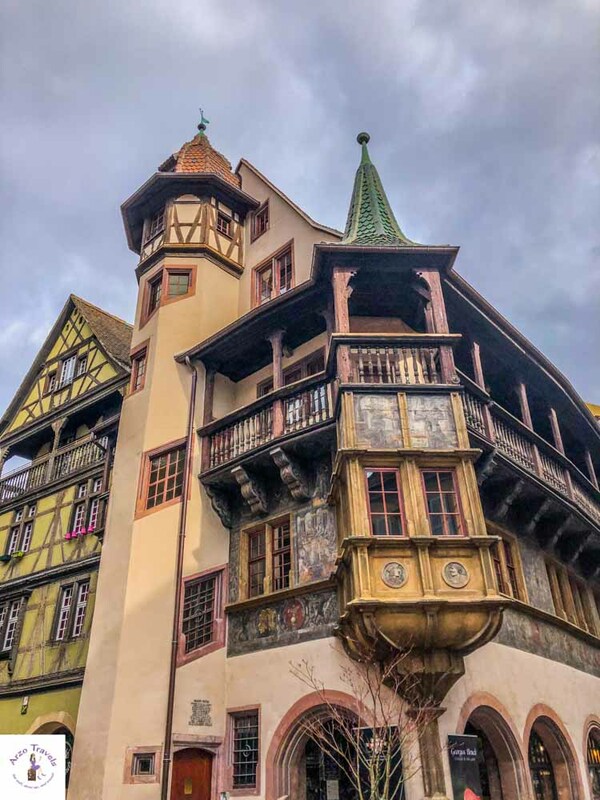 It is one of the most impressive buildings in Colmar, though I almost missed it as it does not stand alone and almost gets lost in between all the other interesting architecture. The Rhine Renaissance-style burgeois résidence was built in the early 17th century and has 105 head sculptures. The Alsace bronze copper is a reminder that this house was used to trade wine. Once the town‘s business and political hub, the Customs House (or Koifhus) was built in 1480. The ground floor served as a warehouse, market, and customs office for centuries. I just looked at the Market Hall from the outside, though it is often rated as one of the must-sees in Colmar. The Market Hall dates back to 1865, and after many other uses, it is again a market today. The “village in a town“ underwent some restorations about 50 years ago – it was originally built in the 17th and 18th centuries. Tanners (people who tan animal hides) used to live in tall, half-timbered houses. They stand on a stone base with no foundations or cellars, and the houses´roofs have several hooks so that hides could dry. 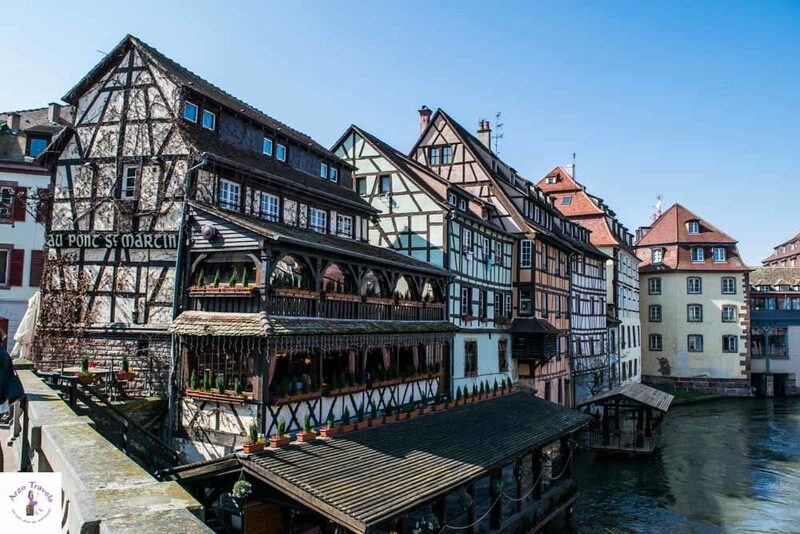 Once home to fishermen, the Fishmonger’s District features a colorful rainbow of half-timbered houses along the Lauch River. Most of the houses were homes to boatmen and fishermen. Nowadays, other means of transportation are used, but back then, the market gardener would sail along the Lauch to transport goods to town. While I have used this kind of sightseeing trains in other cities, I did not use them in Colmar. If you are tired of walking, you can instead hop on one of the sightseeing trains and discover Colmar by train. You can find out about the history of the town during the 35-minute ride. Tickets are about 6€ for adults. Have I ever mentioned my obsession with boat rides? Yes? 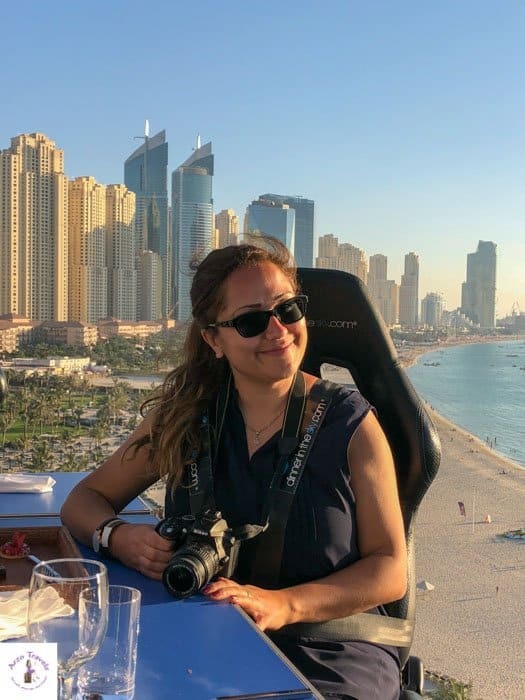 Okay, so I am happiest on the water and for all those weird people with the same obsession as me, you can do a boat tour in Colmar as well. 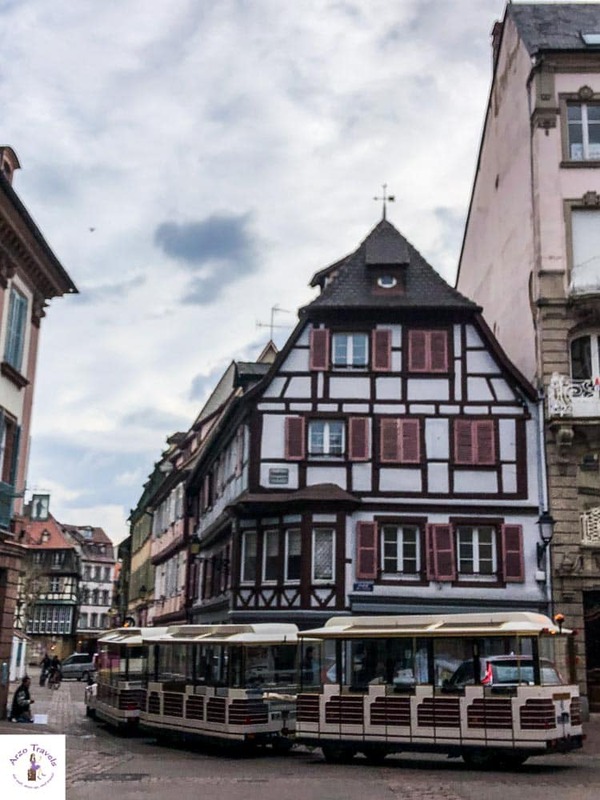 It is not the epic 3-hour boat tour that I did on Lake Thun, but well, the boat ride takes 30 minutes and this is a lazy kind of sightseeing, as you will see the center of Colmar without having to move at all. Alsace is famous for its white wines – the Alsace Wine Route Road Tour is famous for a reason. Alsatian wines are named for their grape varietals. As someone who does not drink any wine at all, I am not familiar, but even I know about the famous Riesling wine. In the summer, there are often wine tastings in Colmar, so for many visitors, these are another fun thing to do in Colmar. While Colmar itself is a beautiful little town, there are some lovely hiking paths close by. Since I was short on time, I did not take any hikes, but if you are interested in more nature time and doing more outdoor activities, then you can choose between easier and even longer hikes in the area. Not far from Colmar is the fun and pretty city of Strasbourg. 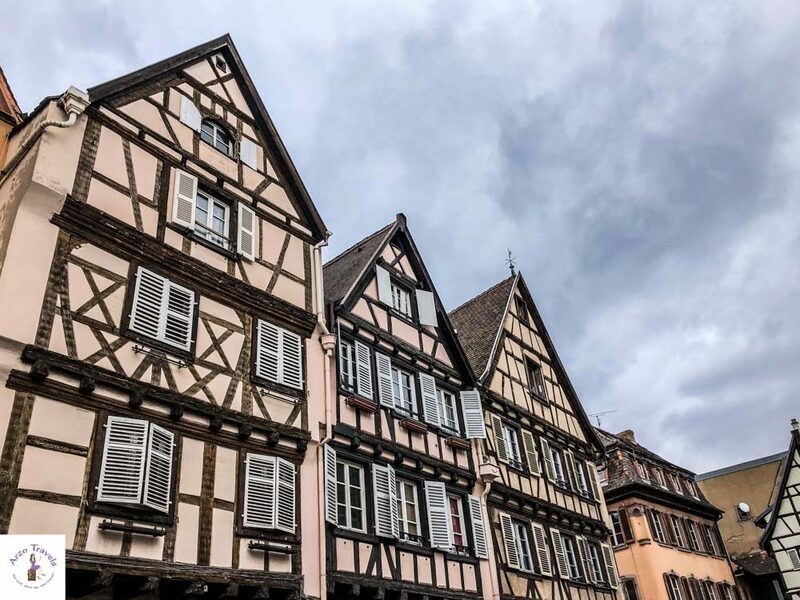 Getting there by car or train is quite easy, and if you have booked your hotel in Colmar for two nights or even longer, make sure to add a day trip to Strasbourg. 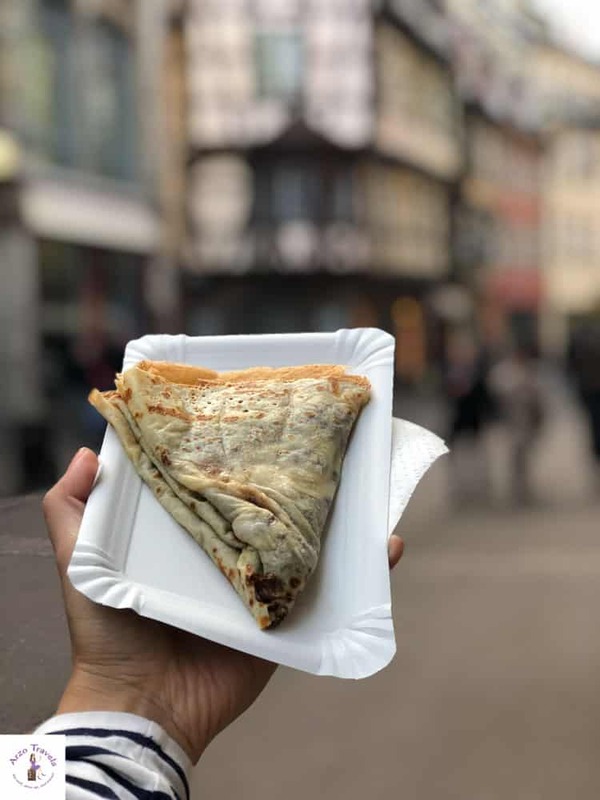 Find a detailed Strasbourg itinerary for a day here. As you can see, Colmar is a beautiful town worth visiting. Do I think that it is the most beautiful town in France? Well, I am not sure. I still vote for Annecy, but in Colmar´s defense, there were no flower pots hanging everywhere (as I had seen on social media and which I personally saw in Annecy), which probably makes the town even more colorful and fun. However, it is a very pretty place and 24 hours in Colmar (or even 12 hours) is enough to get a good glimpse (click here to read my Annecy post and find out why I am so in love). 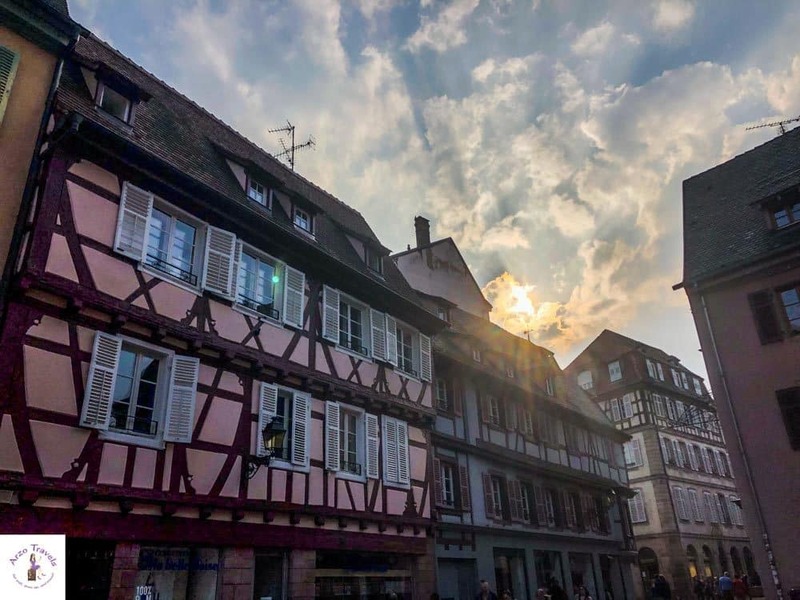 If you stay in Colmar longer, you can spend even more time soaking in the beauty or visiting a few other places that are close by, like Strasbourg. 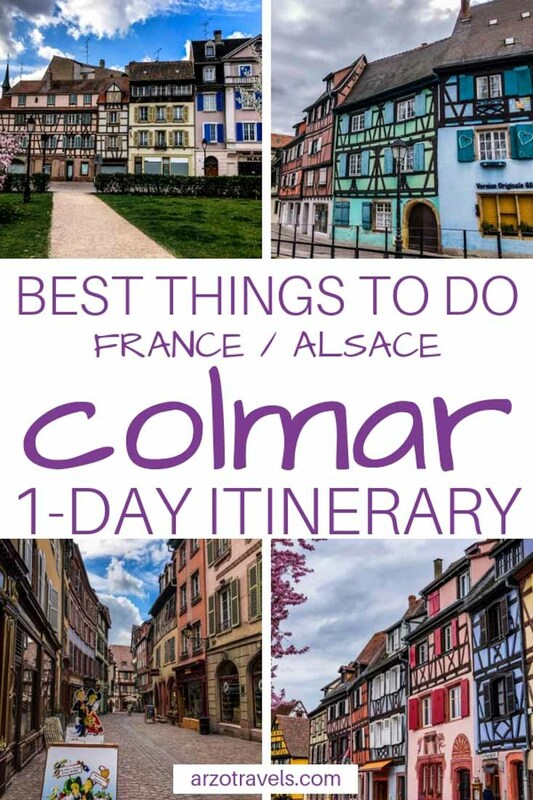 Adding Colmar to your bucket list is definitely a good idea! 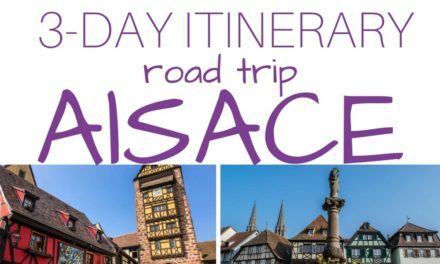 Check out my Alsace itinerary – the best places to see in 3 days.